This workshop will investigate how Educators can involve young people, through genuine participation and consultation, within their school age programming to truly give them a voice. 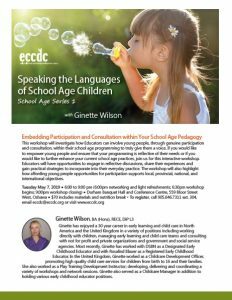 If you would like to empower young people and ensure that your programming is reflective of their needs or if you would like to further enhance your current school age practices, join us for this interactive workshop. Educators will have opportunities to engage in reflective discussions, share their experiences and gain practical strategies to incorporate into their everyday practice. The workshop will also highlight how affording young people opportunities for participation supports local, provincial, national, and international objectives. *Registration fee includes materials and nutrition break.